P50L had the most liked content! "...Ah...Thanks...Say! Do you know how to fight? And use magic? And HOW do I know which mgic I can cast?" Seliph reaches out and grab his Basic, beginner rod. "See, I'm still new to this game, and VRMMOs...you don't need to though! I'm sure...I can figure it out...?" Seliph looks back at the main area where he came in." "Mmmm...!" Seliph got a bit angry trying to figure out how the menu worked, even how to open it. He would just shout "Open! ", but nothing would come up. Many people would start laughing and snickering at a noob who can't open the most important function of the game. "...I'll get through it later. I should take a walk and see the resturaunts!" Seliph looked everywhere, seeing eterans and newbies alike, enjoying te game. Finding banks, weapon shops, potion shops, armor shops of every kind. "Wait, but I don't have money. Maybe the town has some quests...Where can I find money..."
After getting through the Character Creation, a Teenage boy appeared in the starting area. "...Hmm?" Tora looked around to see his surroundings. So many people, many different races! "...!" He saw a fpuntain, maybe if he threw in a coin, he can make a wish? But Tora didn't have any money, he doesn't know how the game worked. Tora then looked at the water, seeing a reflection. He is no longer who he is in reality, he is now known as Seliph, a Novice Wavemaster. "Right then..." *Looking a his hands, body, White Hair, and purple eyes. Gripping his starting weapon, ready to play! "Fire!" He shouted, but no magic would show. "Uh... Come on! Fire!...Inferno! Blaze! ...Heal?" why couldn't he cast any magic? "Ugh...now how do I open a menu?" I could have sworn that was Sword Art Online Uh, because they like The series? Username: Seliph Actual Name: Torahiko "Tora" Nagata Starting Level: 1 Class: Wavemaster Race: Human Element: Wood, shown by a tattoo of a vine around his shoulder Personality: Strong-willed and snobbish, yet kindhearted Bio: Coming from a wealthy family who finds video games a big waste of time, he was able to get his hands on the game. He wishes for a more simpler life awy from the riches he would always be surrounded by every day. Not very fond of showing affection or friendliness, rather more of fighting by the sides supporting others with his talent in magic in-game just like any other MMO he's played. "Data Drain"
(( Be in mind, I'm keeping him neutral until recruited by a Shepard. Or anyone actually )) Saren walks down a lone road. After being framed, and with no proof, he can't do anything. ”I'll get him back one day...I don't need that school...! I will be the best Sage without that school's help!” Saren was later approached by an unusually large man. With an axe in his hand, the Ruffian exclaimed: ”Aww,, you shouldn't be alone in the wild boy. Didn't your mommy ever warn you about strangers?” Saren leered at the Ruffian, only being insulted like the way anyone would insult Ricken. ”Come here, boy! You're commin' with me! You'd make a fine servant for the boss!” Shouted the Brigand. ”Back off, you giant oaf! Don't try and scare me, because I ain't afraid!” Saren threatened back, keeping his guard. ”Oho.....alright. Time to teach yoy some manners!” The brigand shouted. The Ruffian charged at Saren with his axe, ready to strike! ”Yeow..!” Saren wasn't well with getting hit, and took a big toll. But he was still standing! 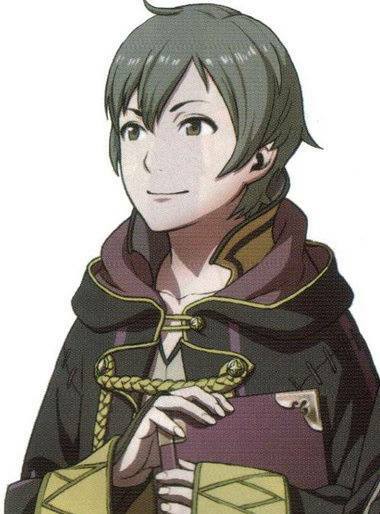 He pulls out a red tome with a symbol of Fire engraved. ”Get away from me!” He shouted. Saren readies his stance, and opened his Fire tome. With an orange glow, a burst of flame shot out of his hand. ”Eeagh!”, the Ruffian was too slow and got burned badly! ”Had enough? Get away or I'll do it again!” Saren made himself clear. He HATES being pushed around. ”Ohoho...you're good. But You're comming with me!” Shouted the Barbarian. and yet again, he runs after Saren. ”Bring it!” He shouted. Can he survive another blow? Will he be able to dodge in time and counter? Caption the avatar and/or signature above you.